See the Dinosaur Projector in action! Bring realistic dinosaurs into your own room! This high-quality T rex shaped projector has 24 dinosaur images that will project onto bedroom walls, up to one meter/3 feet wide. Features 18 different types of dinosaurs. ROOAAAAR! T rex also becomes a protector for a child’s bedroom, roaring into action with each unwanted visitor. A trembler alert makes your T rex roar when picked up and a motion sensor detects movement. Surprise your friends with five mighty roar sounds! 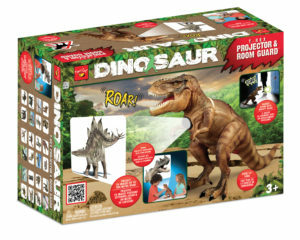 T rex is also a room guard with trembler alert and motion sensor roaring which trigger 5 different mighty roars! Requires 3AA batteries (not included).